For firms with Advanced Analytics or Artificial Intelligence (AI) in their future, Gartner has just published a useful report with three findings that clarify the difference between the two technologies and offers insight on employing them for augmenting versus automating supply chain decision making. People often use these two terms interchangeably, but Gartner says that they are not synonymous. Their recent report entitled Augment and Automate Supply Chain Decision Making with Advanced Analytics and Artificial Intelligence (30 March 2018, Noha Tohamy) says that advanced analytics is the umbrella term for a variety of underlying technologies, whereas AI is a subset of advanced analytics. As shown in the chart above, there are three types of advanced analytics technologies. The more basic, and most widely used, is predictive analytics which employs technologies such as statistical modeling and simulation. Gartner says that statistical modeling is more common because simulation requires more effort to develop and maintain models. The next step up is prescriptive analytics which employs optimization, heuristics and rules-based “expert systems” with business rules defined by humans to solve a supply chain problem. Artificial intelligence is the most leading-edge form of advanced analytics which includes machine learning, deep learning, natural language processing and “cognitive advisers” which are AI-based solutions that interact with business users through natural language. Gartner finds that deep learning is still only emerging due to its intensive data science requirements. Interestingly, Gartner’s poll of 260 users found that except for deep learning, all other categories of artificial intelligence are already now more widely used than heuristics and expert systems. The Gartner report identifies a wide range of supply chain functions where advanced analytics are being employed, including supply side activities such as production scheduling and supplier management. But the top use areas are all focused on demand - demand forecasting, sensing and shaping. Gartner’s research matches what we’re seeing. Firms are looking for ways to employ machine learning to sense demand, asking “What data is out there? Weather. Social sensing (Facebook, Twitter). Consumer sentiment. Macroeconomics. Demographics. How can I take advantage of it? They are looking for cause and effect for short term forecast accuracy and longer term supply chain resiliency. A recent discussion with a retail industry supply chain analyst also aligned with this finding. He said that while the language around AI was ratcheting up in multiple ways, the area of most activity was promotional forecasting. Again, Gartner’s research matches our own experiences here. More firms are asking why planners need to spend so much time nursing their planning system. Large enterprises ask, “What’s wrong with my process that I need armies of planners?” Growing mid-market growth companies ask, “Why do I need to keep adding so much overhead?” Worse yet, firms are asking if all this non-value added effort is preventing them from reaching higher levels of maturity. We see much less of this kind of discussion in S&OP and Integrated Business Planning (IBP). 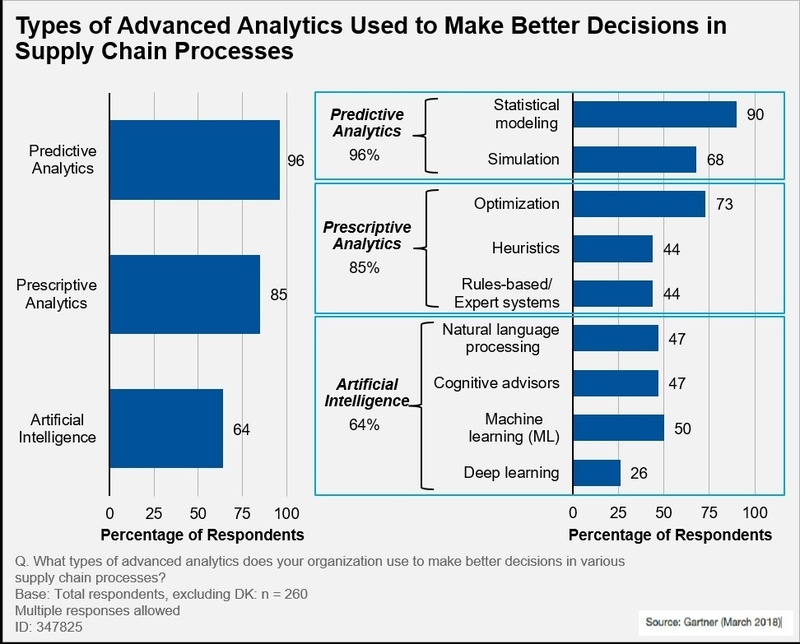 Right now, advanced analytics is still used more to augment, not automate, process decision making. However, Gartner says that difference in use will narrow significantly in the next two years. This matches the message we have heard from other market analysts – automated decision-making is top of mind with every analyst we brief.